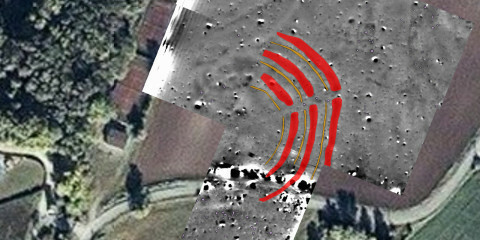 KGA Altruppersdorf could only be surveyed in its preserved western half. 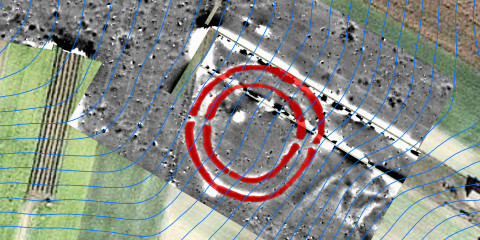 From the quite accurately circular remaining part of the inner ditch we can deduce a best-fit central point. 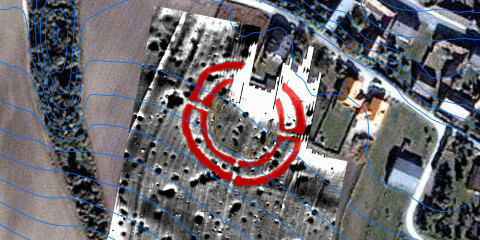 This KGA was surveyed with geomagnetic prospection and was also target of several excavations. 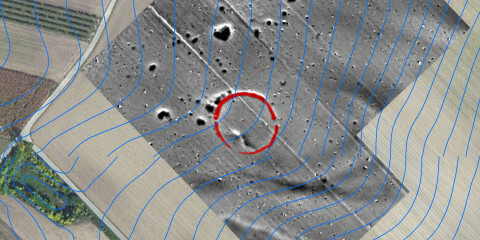 The magnetogram shows traces of a single-ditch KGA but no traces of a palisade. 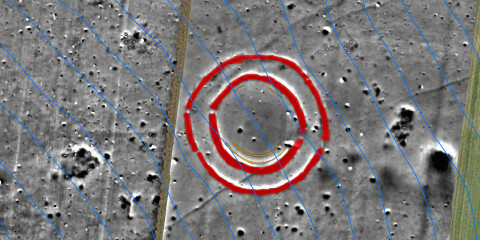 The KGA shows two entrances towards 165° and 326° which are outside of the solar or lunar ranges, making stellar orientation the only possible astronomical relation. 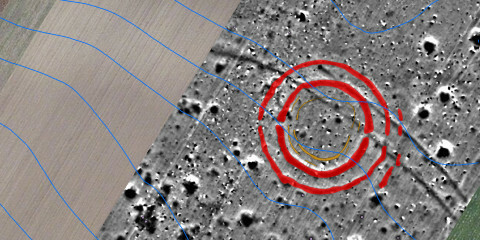 The magnetogram of this small KGA shows 3 gaps, where the southwestern gap appears to be due to strong erosion, so only two can be interpreted as entrances. 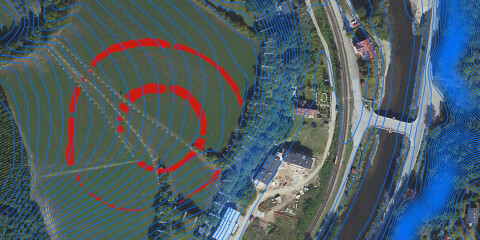 This remarkable triple-ditch KGA has 5 entrances which follow a hexagonal pattern where the northernmost entrance (at azimuth 20°) has been omitted. 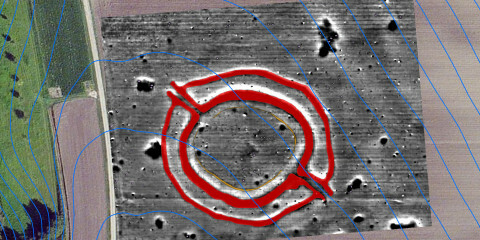 The magnetogram of this KGA shows 3 entrances. A suspected entrance near the north side of this KGA has been lost to a house. This impressive KGA east of today’s Hornsburg had three ditches and two entrances. Standing at the western, slightly lower entrance it may have been possible to see towards the KGA opposite the valley, Hornsburg 2. 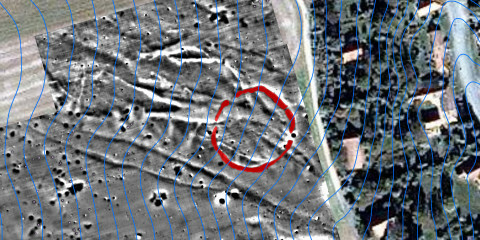 West of todays Hornsburg village we find traces of a KGA with two ditch rings and two entrances which fairly well follow today’s slope. 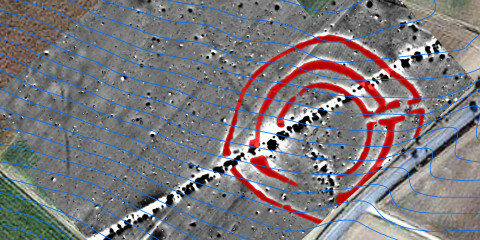 This KGA with two ditches and four entrances approximately pointing towards the cardinal directions has been investigated by large excavations in the 1980s and 1990s. 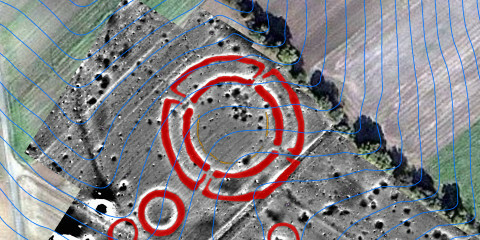 This single ring-ditch features two entrances. 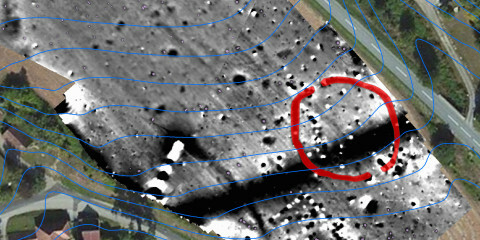 In contrast to most others, here the entrances do not connect the slope line, but they lie nicely on the contour line in terrain sloping more than 5 degrees. 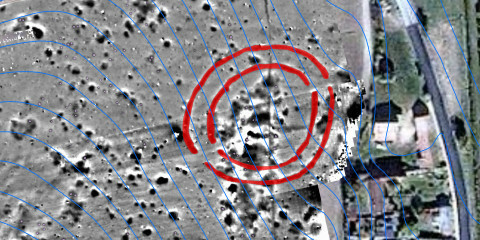 This heavily eroded KGA close to KGA Puch with upto 107m diameter had only one entrance towards south-east still clearly visible in the magnetic data. This KGA with two ditches and three palisades had four entrances. The elevated horizon has forced us to abandon solar calendrical or stellar orientation. 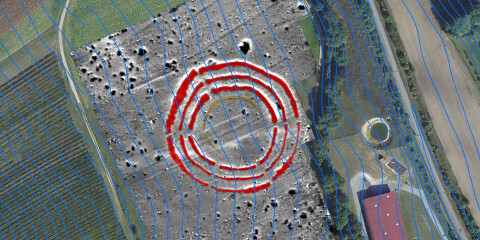 The entrances of this KGA with 78m diameter had previously been interpreted to show calendrical applications. 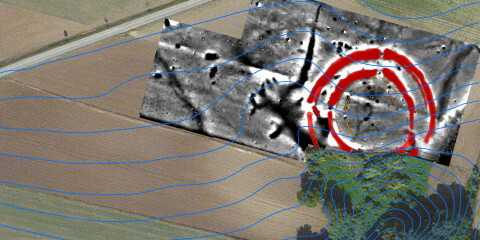 However, the surveyed horizon altitudes contradict and forced us to reject the preliminary result. 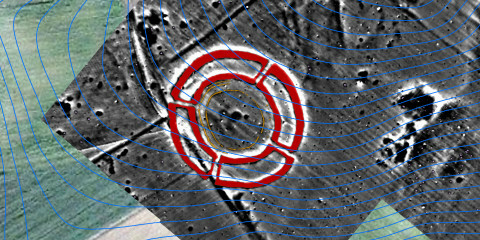 This KGA with an overal diameter of upto 69m had two entrances which however cannot be interpreted as having been orientated to observe any stars or or solar dates. 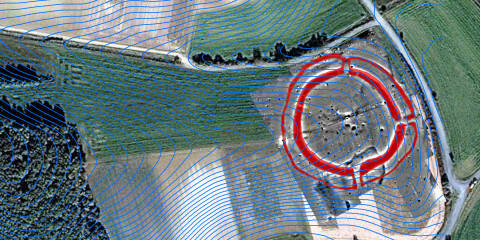 This single-ditch KGA has 58m diameter and shows an uncommon number of three entrances. 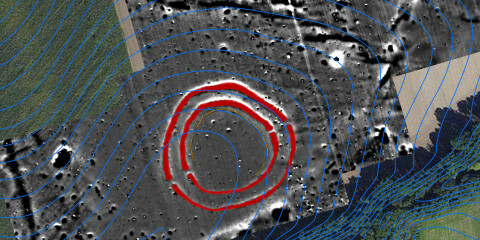 Its southernmost entrance is perfectly on the contour line with the centre in today’s terrain. 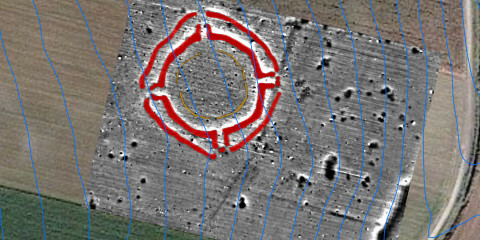 This KGA with 83m diameter is situated on the northern edge of an erosion valey which has already destroyed the southern edge with what may have once been a “lower entrance”. 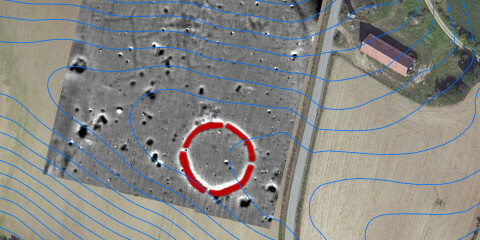 This KGA with a maximum diameter of 92m showed 2 ditch rings with a very uncommon number of three entrances. 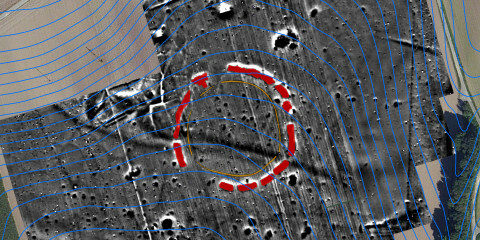 All previous assumptions about their respective astronomical orientation had to be rejected after the horizon surveys and terrain analysis. 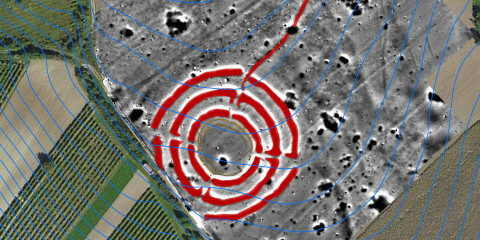 KGA Pranhartsberg 1 shows a typical ground plan with two concentric ditches, traces of up to three palisade rings, and four entrances with narrow earth bridges. 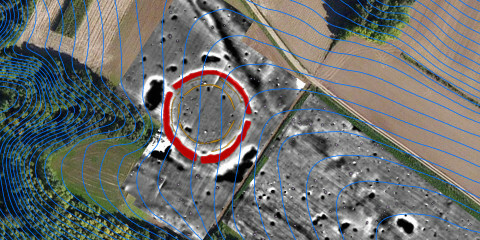 On first glance this KGA appears to have been built with less perfection, it deviates significantly from the near-perfect circle observed in most other KGAs. 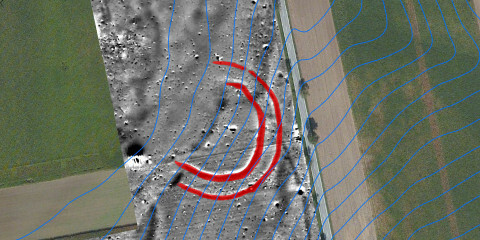 The <em>Kreisgrabenanlage Puch</em> (overall diameter: 83m) had two circular ditches, one palisade ring and two entrances. 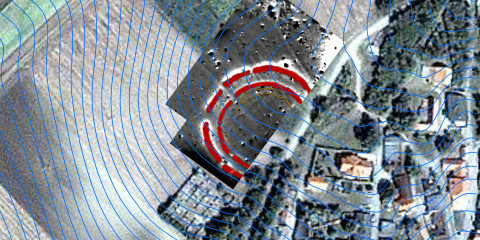 The magnetograms and excavations at KGA Rosenburg (max. 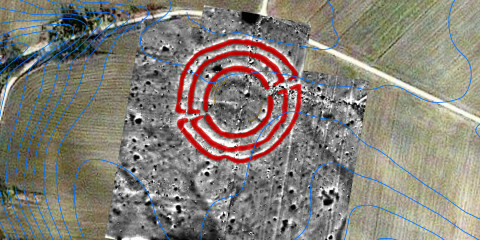 diameter: 46m) show 2 entrances and traces of 2 palisade rings, but the exact width and location of the entrances cannot be secured, leaving the wider earth bridge extents for interpretation. 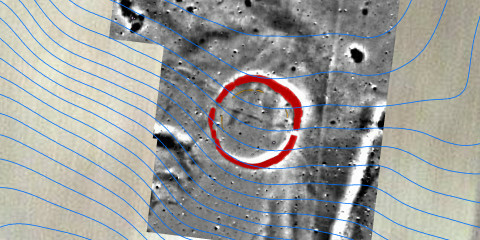 In the older literature we can find an alleged connection of the orientation of the south-western entrance of this rather small KGA (diameter 45m) to a minor lunar standstill. A triple-ditch KGA with two or even three entrances. 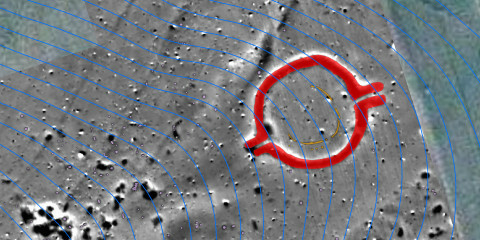 The clearly visible opposing entrances at 74° and 254° do not offer any meaningful astronomical interpretation. This fragment of what may have once been a KGA has apparently been heavily eroded by the Fladnitz river. The only detectable entrance towards north-east is astronomically insignificant. 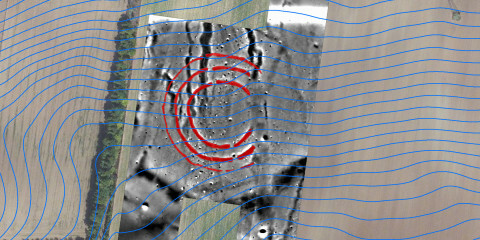 The virtual reconstruction of the KGA at Steinabrunn (2 ditches, 4 entrances, overall diameter 88m) in a small patch of digital elevation model had been one of the cornerstones of the preliminary astronomical interpretation of 2004. 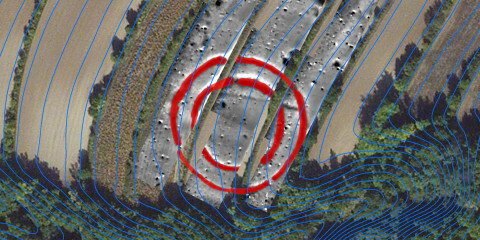 The slope where this KGA once stood has been terraced for agricultural use, the double ditch system was partially destroyed, and the original orientation (or aspect) of the slope cannot be given. 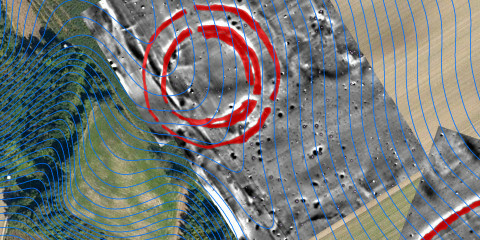 This KGA is in rather flat terrain, and only one entrance can be clearly identified, which does not show astronomically significant orientation but lies almost exactly on the contour line. 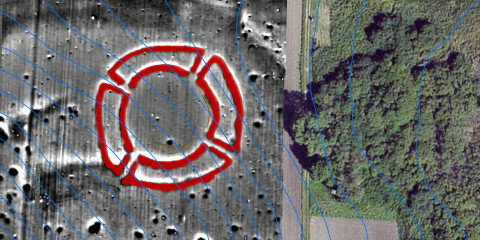 The entrances of this remarkably symmetric KGA (overall diameter 92m) appear to be oriented almost towards the cardinal directions, the right radial ditch of each entrance even more so.